To the North of the Songye territory, live the Sungu, Tetela, the western Kusu. In the northwest we will find a few luba chiefdoms. To the west the Luntu, Luba – kassaï Kete and Binji peoples resides; one can even find pockets of Chokwe people in the southwest of Songye territory. To the south of the Songye we find a variety of luba speacking, polities, the same is true, for eastern frontier where in addition to the eastern kusu, we find Luba, Hemba, Kunda, Lumbu and Buyu people. Judging from their sculpture it is obvious that the Songye had long and early contacts with the Kusu, and their mongo-speacking ancestors the Nkutshu who are living north of them. As well as with various Luba who reside to their south and esat as well as with the Lweta speackers found to the west. They of course also had since times immemorial relation with the hunter gathering peoples who inhabited the forested part of their territory. Scholars disagree as to the early origin of the Songye. Some believe they originated in the migrations of western Bantu, whereas others maintain that they came from a circular migration of the eastern Bantu. Most scholars agree nevertheless that around the year 1000 AD, The Songye originated as a distinct cultural entity in the forested areas northeast of their present habitat. Oral history does not mention the concept of a Songye empire, under the control of one ruler, but records a variety of powerful independent chiefs who eached ruled their cityu states surrounded by agrarian and huntings land. The Songye number about 300000 today, it is unclear how many Songye there were before the many catastrophes that drastically reduces the population during the last quarter of the nineteenth. The Songye lived a rather prosperous and peaceful life or farming and hunting resulting from the advantage of living in a liminal zone where forest and savannah meet and where they exploited the resources of these diverses eco-systems. This until 1870’s. in the last quarter of the 19th century to the nefarious influence of slave and ivory traders of mixed arab. Some songye chiefs and self appointed warlords joined forces with slaves traders to prey on their own people, while others fought the agressors of fled. This and the various epidemic of sleeping sickness and syphilis caused the end of the Songye golden age with its vast city states high culture and well being. The smallpox epidemic in the last quarter of the nineteenth, which more or less coincided with the Tarab presence, further brought the Songye people to their knees. The introduction of new ideas with the arrival of colonial powers further eroded the original songye culture. During colonial times many Songye cultural manifestations went to hiding dur to pressure from colonial authorities, who felt threatened by little understood social and cultural manifestations. Christian missionaries converted many Songye into Christianity, which led to the destruction of many figures and others powers containers. This conversion also sometimes resulted in the creation of syncretic art incorporating traditional Christian ideas. New materials resulting from colonial contacts were introduced in the confection of ritual art. The masking association Bwadi Bwa Kifwebe was forbidden by colonial powers and therefore almost disappeared. Since independence in 1960 a Songye cultural renaissance is taking place incorporating even more new ideas and materials. The Songye believe in a creator, who is conceived as a kind of first ancestral figure, the supreme being for the Songye is EFILE MOKULU, who created all things and all life , he also received all the spirits of the dead and governs them too. No prayer or offering is made to EFILE MOKULU. According to Songye beliefs man is composed of two parts, the body, Tulu, and the soul, Kikuli. It is the Kikuli that is surrendered to Effile Mokulu, after death and which returns to visit in their dreams those still leaving. Some sorcerers possess a third element in addition to the Kulu and the Kikuli : the Doshi, an evil spirit or force that is the cause of nightmares. It is the Doshi that enters into another body and causes illness or misfortune. Animals are not believed, to possess any soul but they have a spirit and are considered as intermediary with other realms. Much attention is focused on familial ancestors to whom sacrifices are made to encourage the well being of the individual and the family. Ancestors and spirit are very much a part of everyday life, of the Songye. Spirits are worshiped especially during the dry season, before a hunt, when crops are sown and when they are harvested. Offerings of food and drinks, are given to this spiritsand to ancestors or guardian figurations. In the past human sacrifices were occasionally made in order to assuage the spirits. A considerable religion force is projected by sorcery and is very evident in the lifes of the songye and in the art they produce. The sorcerer or muloli, therefore is a very powerful figure in the community. Similarly imbued with power and revered by the people are the healers or nganga who use various medicines manipulations and charms to effect their hearlines powers. There also exist diviners who are in touch with the spirit world and regularly contact a variety of spirits for specific purposes. These soothsayers are known as Kitobo, various techniques are used to consult the spirits in one of them termites are thrown into water and the answers are deduces from the way the fish gobbles termites. Yet another technique uses a gourd filled with a variety of symbolically important items and figurines, the gourd is then shaken and the position taken by the various implements will then be interpreted. Another divinatory process uses wooden rubbing frames surmounted with a human head or torso , these oracles katatora appear in the Songye areas bordering the Luba. Bound up with sorcery are women specialists who have the power to deliver a person from possession by an evil spirits. The Songye maintains a variety of brotherhoods, societies and associations as well as sorcerers healers and diviners group who are all involved with religion and beliefs , the Songye believe in the existence, within themselves of a spirit that they call echimba. The echimba is the part of yourself where you think, where you rejoice and where you are sad. The Songye do not believe in ghosts, of the dead but they harbour a firm belief that the soul of a dead father continues to exist until it is reincarnated in another body, and that is soul watches and guard over its children. Their omnipotent god lives deep within the bowels of the earth and it is therefore useless to adore him. The Songye can be divided in about 30 sub groups most of them of Kalebwe origin. The dissident kalwebe from the southwest were the conquerors, but the Tshofa kalwebe from the north formed the aristocratic core, in the tradition. This core was organized around a supreme chief the Yakitenge, who, with the advisors the Twite constituted the central power. The land and forest chief sultani ya muti supervides the distribution of land and hunting territories to families. The large chiefdoms sustained real cities spread over miles with markets artisans and traders. The largest ones were kabinda and pania kutombo. The songye are patriarchal patrilinear exogamous and some are polygamous. During the fifteenth century, the Songye moved from the province of Shaba (south east of the Democratic Republic of Congo) and settled along the left bank of the River Lualaba on a tray covered with forest and savannah. Divided into many subgroups, one hundred and fifty miles Songye are governed by a central leader, the Yakitengé, whose function requires it does not show strong emotions, not having any contact with the villagers, and not drink not in public. More local chefs, distribute land to the villagers, but a powerful secret society outweighs their power. Unlike their neighbors Songye society is patriarchal. The Songye create impressive statues and masks, with powerful features used in ceremonies related to their secret societies. The statues are often covered with props. Regional stylistic variations, due to the large extent of territory may be observed. 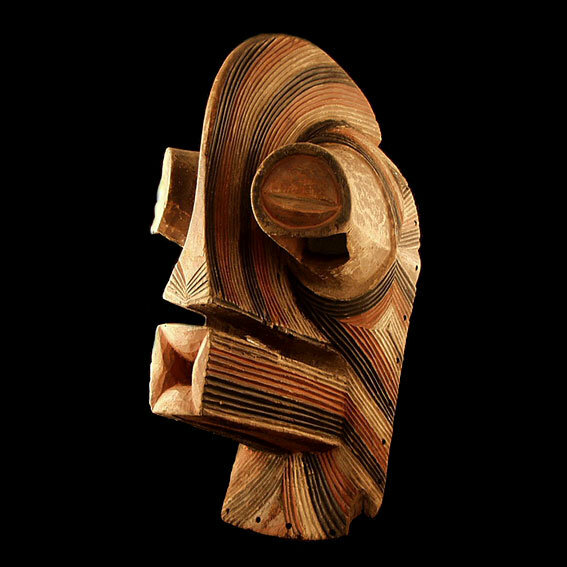 The type of mask is the best known kifwebe, which can be translated into dialogue Songye mask. Her face covered with scars linear incised shows a rectangular mouth, and a long nose located between protruding eyes. It can be masculine if carved with a central peak, or if it bears a female hairstyle smooth. The size of the sagittal crest of the male mask indicates its power. Initiations during circumcisions and funerals, a dancer covered entirely from plant fibers appeared. The wearer of the mask male adopts an aggressive and unpredictable. To encourage social conformity. While wearing the mask feminine, softer movements and controlled to improve fertility in women. Representations of masks are also kifwebe on objects related to the secret society, such shields. Songye fetish statues are numerous and vary in size from 10 to 130 cm, they are usually men standing on a circular base has elongated torso and hands resting on the abdomen. Their large head represents a pointy chin square or slightly open mouth, and a triangular nose framed by large protruding eyes. Strips of metal nails, and other accessories are sometimes applied to the face forces to fight against evil and aggressive and direct lightning against them. Over the top of the head and belly are often dug in order to contain substances, magic, Nganga the specialist is responsible for attaching the statue magical objects such as snake skins, feathers, necklaces metal, and bracelets with the intent to strengthen its power. Sometimes these statues are suspended for apotropaic, inside houses, with iron hooks passed under the arms. Large fetishes to protect communities were kept in huts, while smaller fetishes were reserved for individual use and protected against disease and death. The manipulation of these fetishes often took place during new moon phases. A group of twenty statue and stool offer similar stylistic features such as large flat feet, breasts conical hairstyles and incised was identified as the result of work of an artist or workshop active.